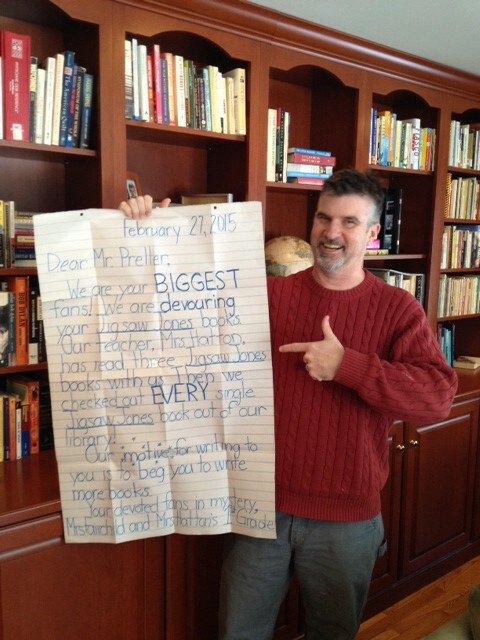 I have received many letters from readers who claimed to have been my biggest fans. But yours was definitely the BIGGEST LETTER I ever received. I fact, you had me scared. I thought that it might have been from a GIANT. Who else could have written a letter that large? You really don’t have to beg me to write more books. I think that I’ll always be writing – even when I’m an old, old man without any teeth! Of course, by then I’ll probably write books about how much I miss eating apples. You know, sitting in my rocking chair, eating Jell-O, remembering how nice it was to have my own teeth. I am trying to write new stories for readers your age. But I have a rule: Never talk about a book until it is finished. I don’t want to jinx anything. When you get a little older -– and braver -– you can try some of my “Scary Tales” books. In the meantime, thank you for that super-sized letter. I loved it! Keep reading books, any books at all, even mine.